The Netflix business model of all-you-can-eat for a monthly flat fee is catching on in other industries, least among which is video games. And it could be coming soon to an HTC Vive headset near you soon if that company has anything to say about it. In a bold new offering that we can only surmise is meant to secure customers for the long haul, HTC announced plans to bring a Netflix-type service to its Vive headsets for a monthly fee of $9. This would help the company both lock in new customers and retain old ones in the face of ever more options in the VR headset market. For consumers, it could present a real value proposition as it gives you unlimited access to a ton of games for relatively little money. The service, to be called Viveport Infinity, will give you unlimited access to VR games for $12.99 a month or $99 per annum. As outlined above, early adopters can get the service for $8.99 for the year 2019. The Viveport Infinity service will work on any Vive-compatible platform including Oculus Rift and other headsets that make use of HTC’s development platform, Wave, according to Tom’s Hardware which also reports that the service will offer other, non-gaming experiences as well such as VR-enhanced media entertainment. Tom’s Hardware also reports that to celebrate the premiere of the new service, HTC will be offering a ton of titles on discount for about five days, spanning April 2 to April 7. As a business model, Netflix’s way of doing business is changing multiple industries and making a lot of old market players rethink the way they deliver content. Microsoft for its part has touted ideas of a platform agnostic Xbox games streaming service while Sony has already made inroads into launching just such a thing. Probably the biggest announcement in the streaming area lately is Google’s Project Stream and the more recent revelations that that company plans on taking a more active position in the gaming industry in the future. Taking those things into consideration, Viveport Infinity could either be a case of HTC reading the tea leaves and seeing what’s coming or part of a plan to wall off a segment of the VR gaming population a la Apple’s services in order to further monetize them later. 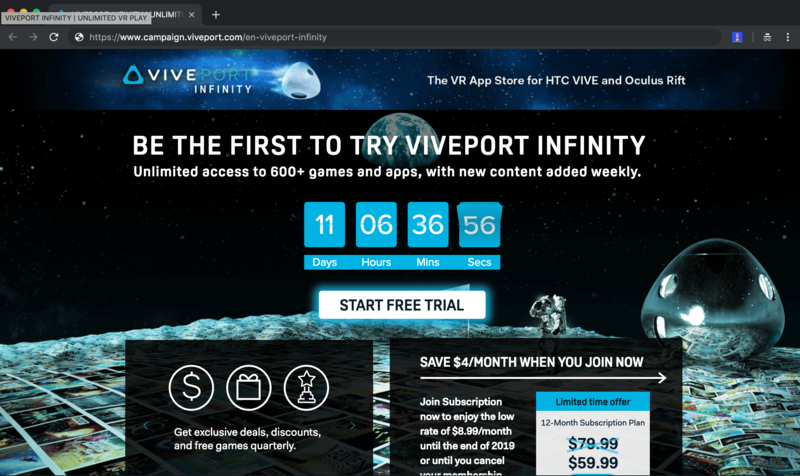 Whatever the case, it is hard to argue with the unlimited games proposition that these services offer and we can only hope that HTC’s Viveport Infinity is everything it promises to be and more.